If you're interested in entering the competition, please download the official info package here. The electronic entry form will go live just before the submission shipping window in June. Deadline for entries is July 1, 2014. I am looking forward to celebrating and rewarding your creative crochet this summer at the CGOA Conference in Manchester! 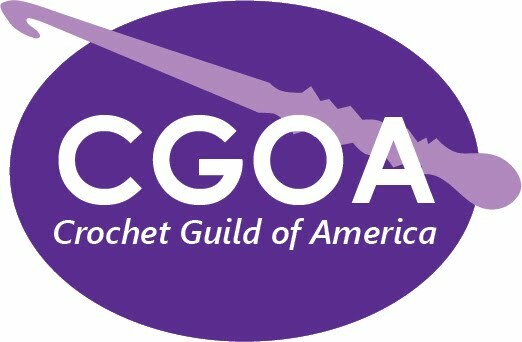 Once again CGOA offers vast opportunities for those that are, or those that strive to be, professionals in the crochet industry! At the Knit and Crochet Show this July 23-27, 2014, in Manchester, New Hampshire, there may not be the traditional “Professional Development Day (PDD)”, but there are many learning and networking options available. On Wednesday, there are three different events that can aid any professional. “Get Your Geek On” is an opportunity to discuss crochet structure and technical processes of actually creating a stitch; while “Master’s Crochet the CGOA Way” may be focused on the CGOA Master’s Program, but will share with you information that will improve your crochet abilities and help you to look critically at your work. I cannot forget “Professional Think Tank”, an informal setting that is designed to aide all crochet professionals, by addressing your pressing questions, and honing your communication skills while networking with others. However the opportunities do not end with Wednesday. · Thursday “Design Inspiration” with Lily Chin. · On Friday there is “How to Market Your Knit & Crochet Business” with Kate Preston and “Independent Pattern Publication” with Mary Beth Temple. · Saturday continues different options with “Color Theory and Fiber Artisan” with Suzanne Allen. · While Sunday rounds out options with “Healthy Hands” with Suzanne Allen, “Draping a Pattern- a Demonstration” with Lily Chin, and “Teaching Challenges” with Karen Klemp. This list does not even include all the wonderful technique classes available, there are so many to list that I would basically be reposting the class listing. There are also many “informal get-togethers” being planned for those that are recognized as Associate Professionals and Professionals with CGOA (keep an eye open on the Professional Yahoo Group for the locations and times, they will be posted as the event nears). If you are interested in applying for Associate Professional or Professional status, please apply here (www.crochet.org). If you are able to attend this, the 20th Anniversary conference of CGOA, you will not be at a loss for learning and gaining new friends! 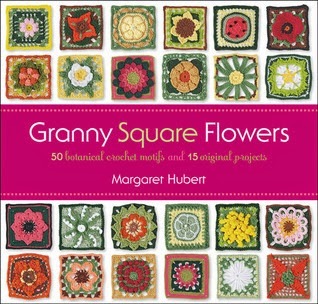 From one of the hardest working crochet designers in the US comes Margaret Hubert's latest book, Granny Square Flowers. I've always been a fan of flower motifs and these wonderful flower grannies are fabulous; a plethora of flowers! The first chapter includes techniques used in the square construction such as making a chain ring, an adjustable (magic) ring, and how to crochet in the round. It discusses an invisible join at the end of the round and there is information on gauge/tension and adjusting sizes of the blocks. Seaming is illustrated with a whipstitch seam, weave seam, single crochet seam, chain join and lacy chain seam. Then, you move onto the square patterns. As the title states, there are 50 individual square patterns. There are designated flowers for each month of the year, which would be perfect for making a birthday afghan. I just love August's poppy flower! After these 12, there are the remaining 38 squares, each unique and beautiful. All patterns include a large, well-lit photograph of the block, written instructions and a stitch diagram. Wait until you see the Large Dahlia with Leaves square! Wow! Oh, and the Poinsettia. My goodness, I could go on and on. Some of the squares aren't actually named after flowers. There are Orange Slice and Lemon Slice, for example. But, that just shows you the huge variety available in the book. After the square patterns, I got a wonderful surprise. There are projects too! Unlike most square or motif dictionaries, this one includes some terrific projects as well. There is a cardigan, a shawl, a tasseled ski hat, a short sleeve jacket, a scarf, a handbag, a trio of little amulet bags, a little girl's sweater and matching hat, a little toddler summer dress, a mesh long-sleeve pullover, adorable slipper boots, placemats, a baby afghan, a hassock, toy blocks and a lapghan. The great projects show the variety of ways squares can be used to make something extraordinary. Working flower squares is more of an intermediate level skill so a beginner would need to "work up to" the patterns. But, making squares is a really wonderful way to build your skill level! I don't think I could ever tire of this book. I can imagine using it for years. The designated birthday flowers are especially intriguing for gifts. And, I have always loved exchanging squares for friendship-ghans. Granny Square Flowers is available in hard-copy (spiral bound) and Kindle download. Full disclosure: A free review copy of Granny Square Flowers was provided by Creative Publishing. Although I accept free products for review, I do not accept additional compensation, nor do I guarantee a positive review. My reviews are based entirely on my honest opinions. Originally published in Norway last year, this title now comes to America. Crochet for the Kitchen is packed with 45 kitchen worthy accessories. Potholders abound, with modern designs as well as cute retro-inspired hot pads. There are also placemats, a dish cloth and a hand towel. The yarns represented in the book are not all easily obtainable in the U.S. CYCA numbers are given for the yarns, but if one is substituting yarns, it might be prudent to look up the yarn in the book online, as all of the yarns are listed in the book as CYCA #1 or #2, but one example given is Rowan Hand Knit Cotton, which is actually a worsted weight. If the stitcher is alert to the size hook used and looks up the yarn, it should just be a simple matter of finding a suitable substitute to recreate the author’s projects. 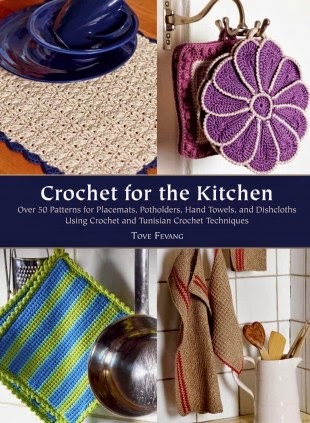 As an added bonus, Fevang’s projects include Tunisian crochet items as well, which wear very well in the kitchen. If you like making potholders, this is the book for you! Full disclosure: A free review copy of Crochet for the Kitchen was provided by Trafalgar Square Books. Although I accept free products for review, I do not accept additional compensation, nor do I guarantee a positive review. My reviews are based entirely on my honest opinions. If you have ever wanted to experiment with wire crochet, this book gives some excellent pointers. The project count is twelve. All of the bags are small and crocheted with 30-gauge paddle (floral) wire. The author is quick to point out that crocheting with wire is hard on one’s hands, so she suggests using a pair of cloth garden gloves when crocheting. The projects incorporate sequins, beads and ribbons to create lovely little purses, suitable for a night out on the town or for a little girl’s play purse. There is a section on creating linings for all of the bags, as well as tips on how to finish wire ends so that they don’t work loose or poke out. The suggested hook for all projects is a size E (3.5mm). This is a great guide to beginning to crochet with wire and the bonus is that you will end up with a cute bag! 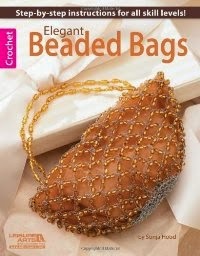 Full disclosure: A free review copy of Elegant Beaded Bags was provided by Leisure Arts. Although I accept free products for review, I do not accept additional compensation, nor do I guarantee a positive review. My reviews are based entirely on my honest opinions. 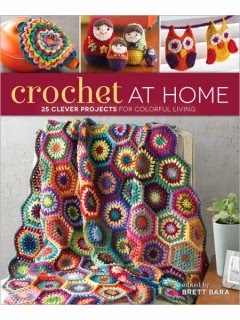 Crochet at Home: 25 Clever Projects for Colorful Living is a collection of contemporary home decor projects edited by Brett Bara. If you were a fan of Crochet Today! when Brett was the editor-in-chief, you will find the types of projects and colors you might have seen in the magazine in this book. The book is organized into three chapters, Bright and Modern Living Room, Tranquil Bedroom, and Colorful Kitschy Kitchen. The names accurately describe the types of projects you can find in each chapter. In the back, you can find pattern abbreviations, a techniques section using the standard line illustrated instructions you may be familiar with from other Interweave publications, a resources section with yarn company contact information, and an index. and an ottoman, a doorstop, a rug, a trivet. a scrubbie for pots, a dishcloth, coasters, a table runner, and a seat cushion. All of the patterns are written with US pattern abbreviations, and most also include international stitch symbol charts. The patterns don’t include difficulty levels, but most can be accomplished by an advanced beginner with a little patience. Each pattern includes multiple, well-lit photos showing the projects in use in a residential setting and is made with yarn in contemporary colors. My favorite patterns are the Stitchy Nesting Dolls by Amy Gaines, the Sleepy Kitty Doorstop by Brenda K.B. Anderson, the Overstuffed Seat Cushions by Ellen Gormley, the Flowering Trivets by Regina Rioux, and Berry Pie, a cake plate cozy by Ana Paula Rimoli. If you enjoy crocheting for the home and are able to crochet beyond the basics, this book could be a great addition to your collection. Like all pattern books, the decision about whether or not to buy this book will be largely dependent on personal taste. You can try out the nesting dolls patterns for free here on the Petals to Picots blog, and Ravelry members can see all of the book’s patterns on its source page. If you have an extensive crochet pattern collection, you may already own similar, classic designs, but the contemporary colors and the styling suggestions may be worth the retail price of $22.95 for the softcover (or $17.95 for the ebook). Full disclosure: A free review copy of Crochet at Home was provided by Interweave. Although I accept free products for review, I do not accept additional compensation, nor do I guarantee a positive review. My reviews are based entirely on my honest opinions. Car Seat Blankets by Becky Stevens is a portable pattern booklet that includes eight small crocheted blankets, designed to fit around an infant or toddler in a car seat. Each pattern includes a small version, usually measuring about 16 in (40.5 cm) x 21 in (53 cm) in light (#3) weight yarn and a larger version, generally measuring about 20 in (51 cm) x 28 in (71 cm) in medium (#4) weight yarn following the same pattern. Each pattern is written with US crochet pattern abbreviations and detailed instructions for working a gauge swatch. All eight patterns are rated easy. One of the patterns is worked in the round, and the rest are crocheted flat in rows. Three patterns include a variation on a chevron, but each one uses different stitch types to create that motif. The small size of Car Seat Blankets makes it portable enough to bring with you to work on the go. The booklet easily lays flat, so you can crochet while reading. On the other hand, the booklet doesn’t include any international stitch symbols and there isn’t much variety in construction methods. If you enjoy crocheting small projects for babies and toddlers while on the go, and have advanced beginner skills, you may enjoy this booklet. The retail price $5.99 for the booklet and $4.99 for the ebook. 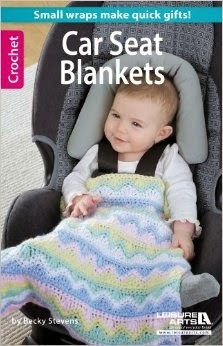 Full disclosure: A free review copy of Car Seat Blankets was provided by Leisure Arts. Although I accept free products for review, I do not accept additional compensation, nor do I guarantee a positive review. My reviews are based entirely on my honest opinions. 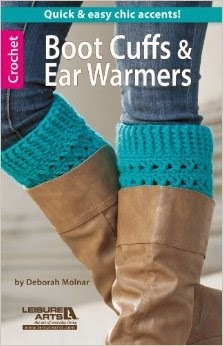 I really enjoyed Boot Cuffs & Ear Warmers by Deborah Molnar. I have been seeing boot cuff patterns all over the internet and I was excited to have the opportunity to make myself a pair. I loved the idea of adding a matching ear warmer to the set to make a complete, fashionable look. This simple booklet from Leisure Arts features five different pattern sets for trendy boot cuffs with matching ear warmers/headbands. All patterns are Easy in skill level and use medium weight yarns (CYC #4) that can be found at any local craft store. The booklet also includes a General Instructions section that includes abbreviations and terms, hook and yarn information, and detailed instructions for some of the specific stitches used in the patterns. I would have to say that my favorite set is the Versatility Set. I love the simplicity of it, but was really impressed with the author's suggestions and modifications for three different options for this style. I was equally happy to see her hints for additional ways to wear the boot cuffs. This is a great book for some adorable, quick crochets that will help you spruce up your wardrobe. You can be fashionable and chic with these great designs. I can't wait to finish my set. Full disclosure: A free review copy of Boot Cuffs & Ear Warmers was provided by Leisure Arts. Although I accept free products for review, I do not accept additional compensation, nor do I guarantee a positive review. My reviews are based entirely on my honest opinions.